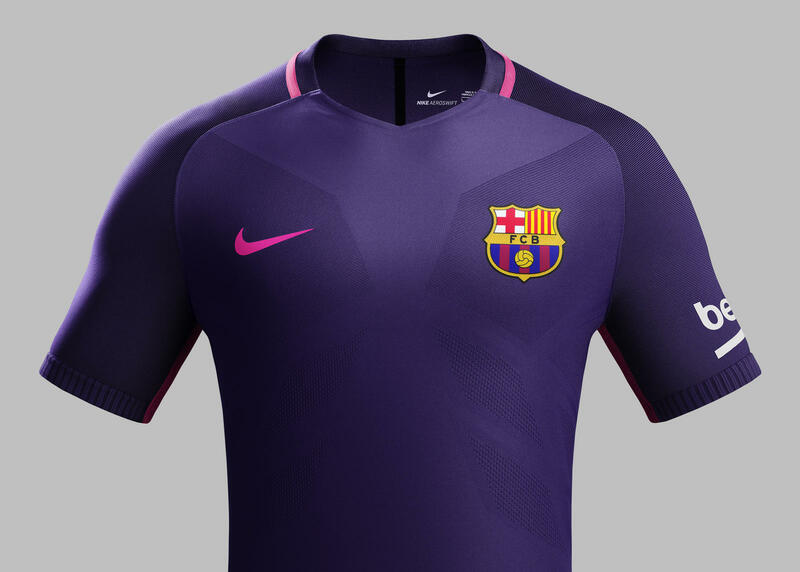 The new FC Barcelona away kit will be available from Nike.com starting July 14. Read more about Nike Aeroswift Technology here. The advanced performance technology in the kit is visible on the chest, where engineered knit zones create a geometric pattern that enhances fit with smaller mesh shapes at the bottom of the graphic. The sleeves and the upper back have been infused with black to produce a darker purple. As with the home kit, odes to club pride appear on the interior and exterior of the shirt. On the the back neck rib of the collar “Barça” is knit alongside a small woven Catalan flag, the Senyera. “Un Crit” and “Valen,” which together mean “Our Cry is Bold” in Catalan, adorn the inside right and left cuffs, respectively. The phrase draws from the club’s official fan anthem “Cant del Barca,” customarily sung prior to kick-off. The shirt’s font, in vivid pink, takes inspiration from the curves of the city’s iconic architecture. 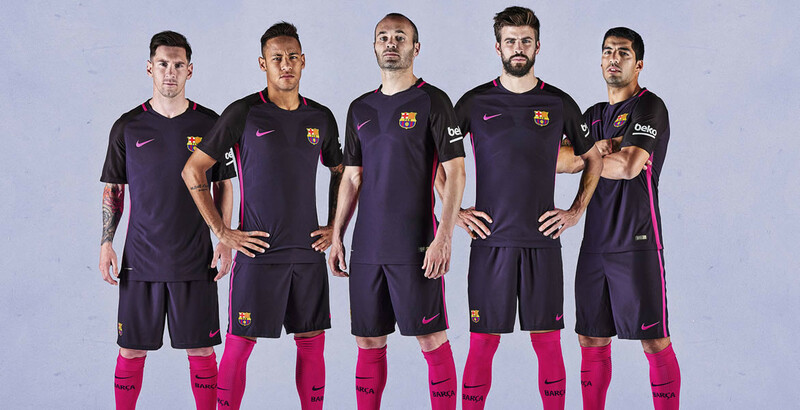 The sides of the kit feature a pink stripe detail that run the length of the shirt to the purple shorts. 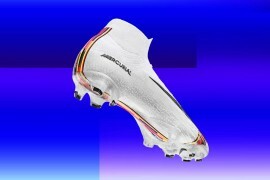 The stripe expands when the player is in motion providing greater ventilation and revealing bold flashes of purple underneath. Pink socks, with a distinctive purple linear graphic on the calf, accentuate a sense of speed. 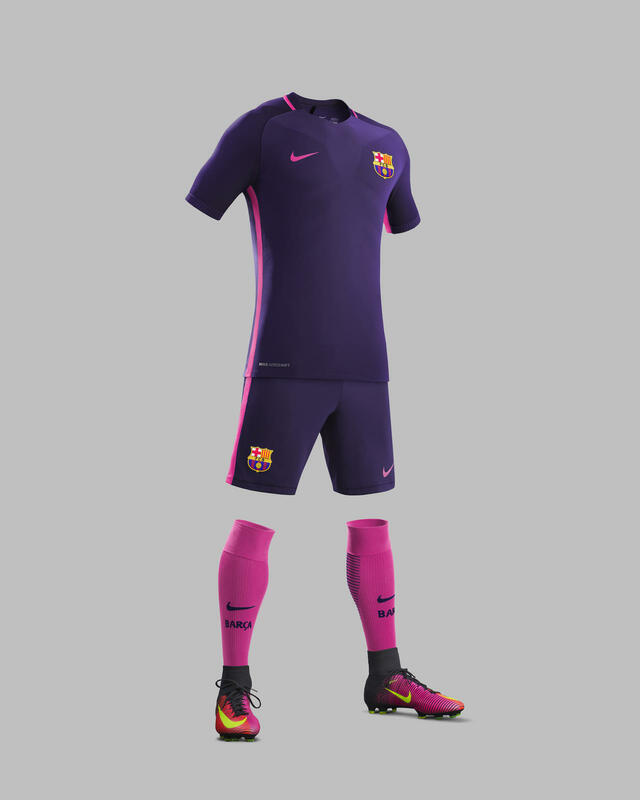 The new FC Barcelona away kit will be available from Nike.com/fcb and official FC Barcelona retailers starting July 14. Read more about Nike Aeroswift Technology here. 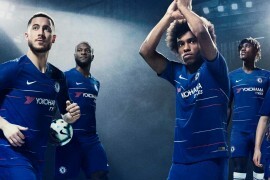 Nike leverages sustainable innovation for its football kits through the use of recycled polyester, delivering unrivaled performance and lower environmental impact. 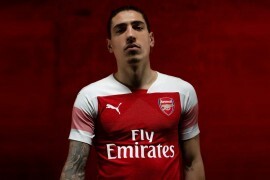 The kit’s shirt and shorts are constructed with recycled polyester fabric, which is made from recycled plastic bottles melted down to produce a fine yarn. Each kit is made using approximately 16 recycled plastic bottles. Since 2010, Nike has diverted more than three billion plastic bottles from landfills into recycled polyester, enough to cover about 5,200 football pitches. 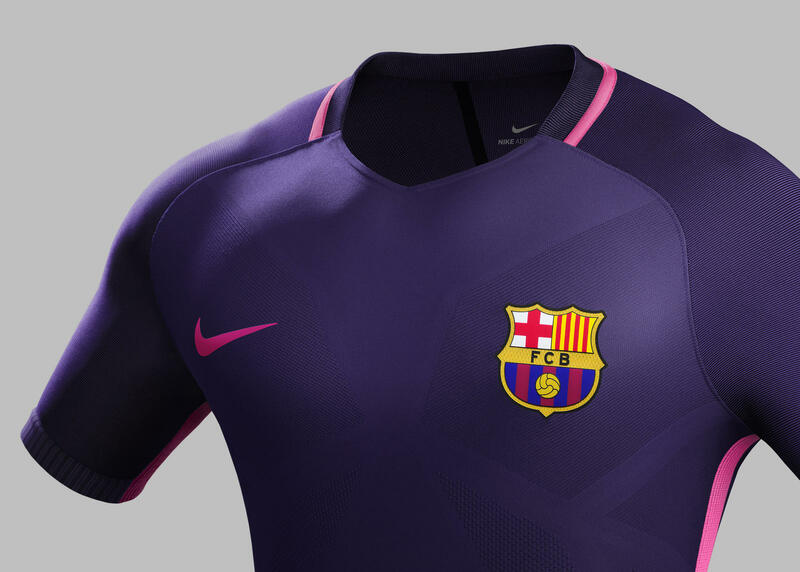 These are Nike’s most technologically advanced kits, featuring Nike AeroSwift technology. They use a new, textured high-performance yarn that wicks sweat from the skin. The shirt and shorts are also constructed using a new knitting process that integrates single and double knit to enhance breathability, stretch and fit.